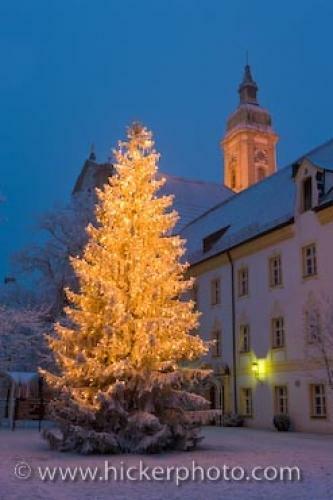 On the grounds of the Landratsmat in Neustift, Freising in Bavaria, Germany, a large Christmas tree is lit and highlights the area in yellow and golden hues. The snow covered landscape enlightens the lit Christmas tree that is displayed outside the Landratsamt in Neustift, Freising in Bavaria, Germany. The whiteness of the snow clings to the branches of the tree as the lights reflect across the landscape bringing out the true holiday spirit in Freising, Bavaria.Christmas tree outside the Landratsamt in Neustift, Freising, Bavaria, Germany, Europe.